EUGENE, Oregon – The 2017 NCAA Division I Outdoor Track & Field Championships unofficially kick off today. 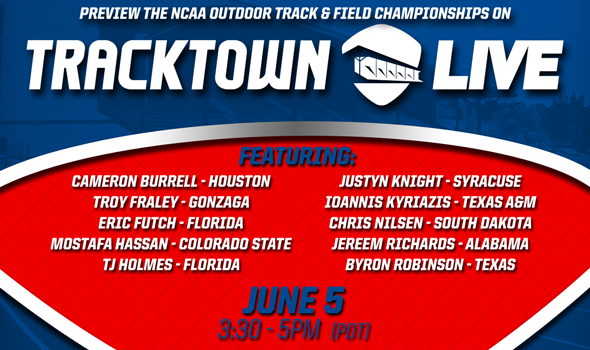 No, there won’t be any action on the track or in the field until Wednesday, June 7, but "TrackTown LIVE" – the NCAA Outdoor Championship Preview Webcast – comes to you live from Hayward Field this afternoon from 3:30-5 pm PT (6:30-8 pm ET). You can watch the entire webcast in the embedded video below. For those who don’t know, "TrackTown LIVE" is a joint venture between the U.S. Track & Field and Cross Country Coaches Association (USTFCCCA) and TrackTown USA that brings collegiate track & field fans closer to the action and helps them get to know the future stars of the NCAA Division I Outdoor Track & Field Championships in a unique setting. Here is a chronological list of those male athletes and their coaches who will be interviewed today by Jordan Kent and Paul Swangard. If you can’t tell, it’s a star-studded lineup featuring two NCAA champs from the indoor season who could very well sweep the crowns (Hassan and Nilsen) as well as three other men who are favorites to bring home an NCAA title this week (Kyriazis, Knight and Robinson). Don’t forget Robinson was also an Olympian in 2016 and finished 16 one-hundredths of a second shy of making the final of the 400-meter hurdles. Be sure to watch the 2017 NCAA Division I Outdoor Track & Field Championships from June 7-10 on the ESPN family of networks. Both the men’s and women’s final days will be aired live on ESPN in prime time.